My hands have some cracking & dry skin and I'm looking for some good recommendations for lotions, creams, oils, ect. I have tried many lotions in the past and even went to the doctor a few times, but no success. Have you tried E45 cream yet? It is really good for eczema / psoriasis, etc. I have heard from a number of people that Bag Balm, from Dairy Association Products, originally intended for cow udder use, is great for this. If your hands are in better shape (no cracks) I would recommend the D R Harris skin food at night. It works well for me after gardening (though a little pricey). (06-25-2012, 06:54 AM)PAW Wrote: My hands have some cracking & dry skin and I'm looking for some good recommendations for lotions, creams, oils, ect. I am a drummer/percussionist. I used to play many gigs and worked in symphony orchestras. Cracked finger tips were the bane of my existence. Lotil was the ONLY thing that ever worked and a lot of the time, the healing was overnight- at least enough to play the gigs. It absorbs to nothing so it feels like nothing is left behind, no greasy feel, no mess but a small amount will heal rapidly. Always a YMMV but Lotil has been a miracle cure for me. Continued use and no more cracked skin. (I have no affiliation with the company but after all of the product that I've used, I should have bought stock....)! 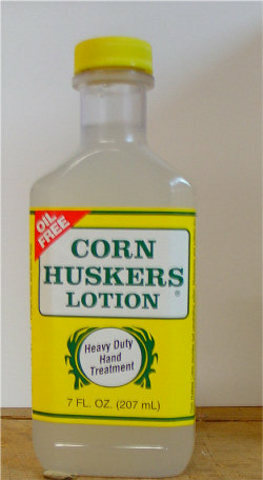 Corn Husker Lotion. Not expensive and you can purchase it from Wal Mart. Many of my friends nd relatives are Iron and Steel workers here in Pittsburgh. They use corn husker lotion for there hands. (06-25-2012, 06:58 AM)churchilllafemme Wrote: I have heard from a number of people that Bag Balm, from Dairy Association Products, originally intended for cow udder use, is great for this. I have used Bag Balm. It does make your hands smooth and works good. It has a very strong petroleum odor (SWMBO did not like the smell at all) and Bag Balm is thicker than petroleum jelly. I had a lot of skin problems when I was working in the Optical business using Acetone and glass cleaner etc...what worked in to apply the cream after you gently wipe your hand while still slightly damp and wear cotton gloves at night to cover the cream you use. Wear proper gloves depending on the work you are doing and basically protect your hands while they are damaged.No prescription medication ever worked as well as mild hand creams...RX usually thins the skin...gloves can help a lot when needed.There is a company called ALLERDERM which sells Cotton gloves and Hypo-allergenic Vinyl gloves..Phone is (800) 365-6868 or http://www.allerderm.com .they also have hand cream and samples...very highly recommended. (06-25-2012, 06:58 AM)Persius Wrote: Have you tried E45 cream yet? It is really good for eczema / psoriasis, etc. Highly recommend Unrefined Shea Butter. Excellent moisturizer for your skin everywhere on your body. I get Gormel Cream from my doctor for use on my feet, but it works on the hands and elbows also. After a few minutes to soak in it works by drawing moisture into the skin. Very high urea content, no scent that I can detect. A little goes a very long way. Does away with skin cracking of the feet for sure. Definitely works elsewhere, it's the best I've ever used. (06-25-2012, 08:48 AM)jfmii Wrote: Corn Husker Lotion. Not expensive and you can purchase it from Wal Mart. Many of my friends nd relatives are Iron and Steel workers here in Pittsburgh. They use corn husker lotion for there hands. Bag balm works great. When I was a mechanic my hands dried out and cracked horribly so I would use bag balm at night before I went to bed and to keep it off the linen I would wear a pair of latex gloves. Once my hands healed I started wearing mechanic grade latex gloves at work and used a good quality non greasy hand lotion. Gotta protect your hands. Picked up some Bag Balm and Corn Husker Lotion today. We will see if it works for me, if not I'll try some E45 cream and Lotil. Pre de Province 100% Shea Butter for the serious stuff. Penhaligons hand lotion Blenheim Bouquet or Quercus in the 300ml Hotel Range pump bottles is amazing stuff too. Neutrogena Norwegian Hand Cream is very good. Inexpensive doesn't mean cheap. I have had the same problem for many years and found that changing my soaps made a huge difference. Stopped using the commercial body washes and and shampoos and began using hand made (artisan style cold and hot process) soaps and shampoo bars and mine cleared up. My doctor was shocked, he was ready to write me some prescription, but when I saw him again they had cleared up. (06-27-2012, 04:10 PM)celestino Wrote: Highly recommend Unrefined Shea Butter. Excellent moisturizer for your skin everywhere on your body. I will also recommend Unrefined Shea Butter. Over this last winter on Celestino's advice my wife tried it for her cracking hands. The USB made a huge improvement in a very short time. I got some of the Leocrema barrier effect cream for my wife and she likes it for her very dry hands. She also uses O'Keefe's Working Hands.